A non-profit organization is an organization that does not distribute its surplus funds to owners or shareholders, but instead uses them to help pursue its goals. Ownership is the quantitative difference between for- and not-for-profit organizations. For-profit organizations can be privately owned and may re-distribute taxable wealth to employees and shareholders. By contrast, non-profit organizations do not have owners. They have controlling members or boards, but earnings may not benefit individuals or stake-holders. A non-profit corporation is an organization that takes the additional steps of incorporating in their home state. What are the advantages of forming a non-profit corporation? The primary advantage of incorporating is liability protection for board members and directors. Nonprofit corporations enjoy the same limited liability protection as for profit corporations. Accordingly, directors or trustees, officers and members are typically not personally liable for the debts and obligations of the nonprofit corporation. For example, if a nonprofit corporation were to be sued, the assets of its directors and members are generally protected because corporate assets are distinct from personal assets. Other benefits include perpetual or unlimited life of the corporation. Please click here for more information on this subject. What are the disadvantages of forming a non-profit corporation? In general, the only disadvantages of incorporating are the increased paperwork that is required, including completing an annual report and other periodic reports to be filed. What is the function of the board of directors and how many board members do we need? The board of directors is the governing body of a nonprofit organization. The responsibilities of the board include discussing and voting on the highest priority issues, setting organizational policies, and selecting and managing your coaching staff. Board members are not required to know everything about nonprofit management, but they are expected to act prudently and in the best interests of the organization. They approve operating budgets, establish long-term plans, and carry out fundraising activities. KNPUSA recommends a board of at least 3 non-related members: President, Secretary, and a Treasurer. For tax exempt purposes, the IRS requires a minimum of three board members. The majority of the makeup of the board must be unrelated by blood or marriage. For example, if you have three board members that include a husband and wife, then you will need to add a minimum of two additional board members that are unrelated to each other and the other three board members. The purpose of this requirement is to avoid conflict of interest issues if the majority of the board were related. We have incorporated as a non-profit organization. Is this all we need to do to be tax exempt? No. This is a source of confusion for many organization administrators. "Non-Profit" and "Tax Exempt" are not interchangeable terms. Becoming a non-profit corporation does not exempt your organization from paying taxes. Applying for IRS tax exempt status is a completely different process from that of incorporating. If you have incorporated but not applied for tax exempt status, please contact us immediately so we may help you rectify this situation. Additionally, the IRS requires that all Articles of Incorporation include a Purpose statement indicating that the organization limit its activities to the exempt purposes as described by IRS section 501(c)(3) Tax Code as well as a Dissolution clause stating that in the event of dissolution all assets will be distributed to another 501(c)(3) organization or a body of government. If your existing Articles of Incorporation do not meet these requirements, then a $59 surcharge will apply (plus any state fees) for KNPUSA to prepare an Articles of Amendment document and file it with your state’s Secretary of State office. Is our organization required to be incorporated in order to receive 501(c)(3) status? No. Incorporating is a completely different process than that of applying to become a 501(c)(3) tax exempt entity. The primary benefit of incorporating is liability autonomy between your organization's directors and the organization itself. Practically speaking, KNPUSA recommends that organizations of all sizes incorporate due to the litigious nature of our society today. Incorporating in most cases would be a prudent business decision. Should we incorporate first or apply for tax exempt status? If you are planning to incorporate your organization, then that must be done prior to applying for tax exempt status. If you incorporate after receiving tax exempt status, then you would be required to re-apply for tax exempt status as your legal organizational structure has been changed which would require a new application including all applicable fees. Processing time varies from state to state. Generally speaking, processing time takes an average of 2 weeks depending on the state. However, some states take much longer than this. Therefore, we highly recommend that you pay the optional state expedite processing fee in Alabama, Arizona, Maryland, New Jersey, New Mexico, and Washington. Please click here to view approximate incorporation processing times in each state. Do we have to publish our intent to incorporate? Currently, only three states require that organizations publish their intent to incorporate; Arizona, Georgia, and Pennsylvania. The exact rules and fees vary by state. Your KNPUSA consultant will advise you of the specific requirements and costs for your state and locality. Please note that publication services and fees are not included in any of our packages. Yes. Nonprofit corporations are allowed to generate a surplus. It can use the tax free surplus for its own operating expenses including salaries or roll the surplus over to the next fiscal year. What a nonprofit corporation cannot do is distribute any profits to officers, directors or employees. What exactly is 501(c)(3) status? 501(c)(3) status is the most popular of the 28 different types of tax exempt statuses designated by the Internal Revenue Service. Simply stated, the 501(c)(3) designation denotes an organization that is exempt from paying federal income tax and, as importantly, can assure its donors that contributions and donations are tax deductible to the donor for federal and, generally, state income tax purposes. How do we know if we qualify to be a 501(c)(3)? Organized-A 501(c)(3) organization must be organized as a corporation or an unincorporated association. The organization must have an organizing document in place such as articles of incorporation, articles of association, or organizational bylaws. Operated-Your organization must be operated primarily for the education and enjoyment of your participants. Certain activities are strictly prohibited such as participation in political campaigns. Furthermore, the organization may not be operated for the benefit of private interests such as the founder or his/her family. Exempt Purpose-To be exempt, an organization must have one or more exempt purposes stated in its organizing document. For example, youth sports leagues meet these criteria by offering amateur athletic programs for children under the age of 18. What types of organizations does your company work with? As our name implies, most of KNPUSA's clients are youth organizations. We work with sports organizations and traveling teams, school booster clubs, and school PTA's/PTO's. We also work with adult sports leagues that promote national and international amateur level competition. Please click here to review a list of some of our current and past clients. How do we find out if our organization is already registered as a 501(c)(3)? If you are unsure of your tax exempt status, please click here and KNPUSA will verify your status with the IRS for free. What are the advantages of securing 501(c)(3) tax exempt status? 1. The primary benefits enjoyed by a 501(c)(3) organization derive from its exemption from paying certain taxes. The tax exemptions include exemption from most United States federal and state income taxes and, generally, from sales tax on purchases. While the state income tax exemption is generally automatic, some states do require a separate application. The sales tax exemption certificate usually requires a state application once 501(c)(3) status has been obtained. 2. Although tax law provides deductibility of contributions for small organizations, the burden of proof for tax deductibility is on the donor. A small organization might choose to apply for 501(c)(3) recognition to save donors possible embarrassment and inconvenience during an audit. 3. Studies show that donors are likely to donate between 50%-100% more if their donation will be tax deductible. Contributions made to 501(c)(3) organizations are tax-free and exempt from federal taxation. Income earned by your non-profit is tax-free. Your non-profit has perpetual life so that it can continue operating in a tax-exempt status even after the original founders move on. 501(c)(3) status qualifies your non-profit organization to receive some of the millions of dollars in private and public grant money. If you are not recognized as a 501(c)(3) organization, these foundations and philanthropic organizations will not allow you to submit a grant (request) for money. Being a 501(c)(3) will qualify your organization for participation in hundreds of governmental programs operated by federal and state agencies. The government will only allow nonprofit organizations with 501(c)(3) status to participate in these programs. Lower advertising rates in publications. Lower postal rates on mailings. Discounted web hosting from Internet Service Providers. Free radio and PSA announcements provided by local media. What are the disadvantages of having 501(c)(3) status? Practically speaking, there are no disadvantages to having 501(c)(3) status. Normally the expense, upwards of $3,500 that most firms charge, is a major deterrent for organizations wishing to become 501(c)(3) certified. However, KNPUSA prepares all of the necessary application forms starting at only $399 plus the IRS application fee. In all likelihood, you'll recover this fee with increased donation amounts and the capability to receive grant funds. The second deterrent is the complex array of application forms and other requirements. This problem is alleviated as KNPUSA takes care of all of this for you for the one time low fee! Please visit our Fees section more information and current prices. Our organization is run by volunteers, aren't we already tax exempt? No, not necessarily. Current tax law does not require a 501(c)(3) application when an organization normally has gross receipts less than $5,000 per year. An organization that has gross receipts greater than $5,000 per year must file for 501(c)(3) status. Our revenues are more than $5,000, but our season is only 3 months per year, do we still have to apply for 501(c)(3) status? Yes. The length of your season is irrelevant. What if our revenues are greater than $5,000 and we haven't applied for tax exempt status? If you are not tax exempt, then you are required to file annual business tax returns and pay income taxes at prevailing rates. Depending on how long your organization has been in existence, you may owe back taxes and penalties if you have failed to file returns for past years. Furthermore, if you have already received donations, they are not tax deductible to your donors. Contact KNPUSA immediately for assistance in this situation. IRS penalties for not filing for tax exempt status are $20 per day. We've been in existence for over 20 years and haven't applied for tax exempt status, what are our options? In most cases, KNPUSA can apply for tax exempt status on your behalf retroactive to the date that your organization began operations, therefore relieving you of any income taxes or penalties owed. Do you work with adult organizations? Yes. Although the majority of our clients are youth organizations, we offer our services to adult sport's organizations that meet the criteria described in the following paragraphs. There are two types of adult level amateur athletic organizations that can qualify for tax-exempt status under the federal 501(c)(3) tax code. The first type is an organization that fosters national or international amateur sports competition but only if none of its activities involve providing athletic facilities or equipment. The second type is a Qualified amateur sports organization (discussed below). The difference is that a qualified amateur sports organization may provide athletic facilities and equipment. Donations to either amateur athletic organization are deductible as charitable contributions on the donor’s federal income tax return. However, no deduction is allowed if there is a direct personal benefit to the donor or any other person other than the organization. 2) Primarily to conduct national or international competition in sports or to support and develop amateur athletes for that competition. The organization’s membership may be local or regional in nature. What can we do if we don't meet the criteria as an amateur athletic organization? If you don't qualify under the 501(c)(3) tax code, you may qualify for tax exempt status as a 501(c)(7) organization. The primary difference between the two statuses is that donations to 501(c)(7) organizations are not tax deductible. Your primary benefit is that you will be exempt from federal taxes. "EIN", or Employer Identification Number, is a nine digit number that the IRS assigns to organizations and corporations. The IRS uses the number to identify taxpayers who are required to file various business tax returns. EINs are used by employers and organizations, including nonprofit associations. This number is known by several different names - TIN, EIN, FEIN (short for taxpayer ID number, employer ID number, or Federal Employer ID number). 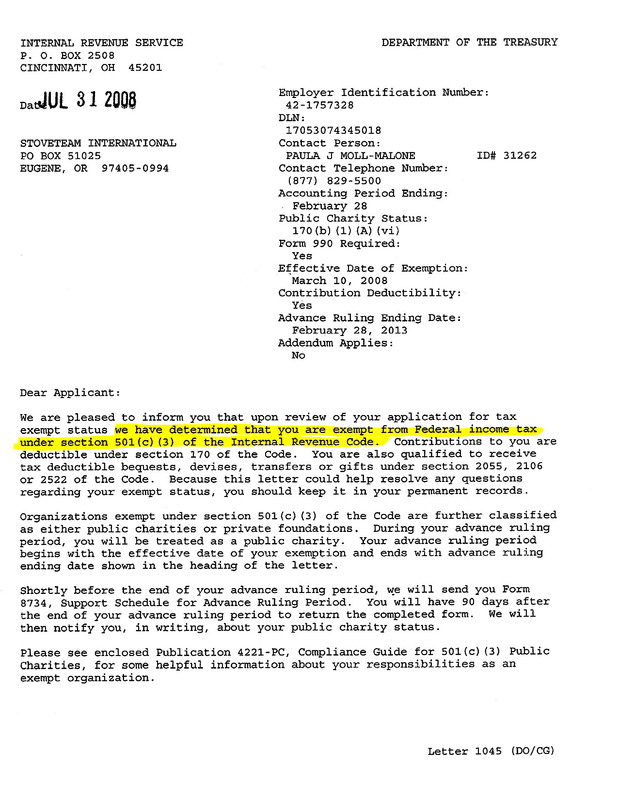 An EIN is required prior to completing the 501(c)(3) application. KNPUSA can assist your league or team secure an EIN if you do not have one. Please refer to the Services section of our web site for more information. We already received a non-profit EIN. Is this all we need to do in order to be tax exempt? No, this is a common misconception. Acquiring an EIN is merely the first step in the lengthy and complex application process of receiving 501(c)(3) certification. In fact, the IRS does NOT issue a special number to recognized charities. The ID numbers the IRS uses for charities and other tax exempt organizations are the same as the numbers the IRS uses for taxable corporations, etc. - the Federal ID number. The EIN does not indicate in any way whether an organization is tax exempt. No additional "tax exempt number" is assigned when an organization gets 501(c)(3) or other tax exempt status. The only proof an organization has that it is tax exempt is the Determination Letter that you will receive from the IRS upon approval. What is the difference between Articles of Association and Bylaws? Articles of Association-The Articles of Association is the founding document of an entity. They set forth, among other provisions, the purpose and main powers of the entity, voting rights of members, and limitations. It is similar to articles of incorporation, but more commonly used to refer to the founding document of a non-profit organization. Bylaws-Bylaws are rules and regulations adopted by an organization for its internal governance. Bylaws detail the responsibilities, rights, and duties of directors and officers. At the organization's initial meeting, the bylaws are adopted. What information needs to be included in our Articles and Bylaws? Is acquiring 501(c)(3) status worth the costs and time involved? Using KNPUSA's low cost services to acquire tax exempt status, there are probably very few organizations that wouldn't stand to benefit from acquiring 501(c)(3) status. Once you reach the rank of tax exempt status, you will find very quickly that an entire new world of revenue resources will be at your fingertips. In our many years of assisting youth organizations through this process, we have yet to receive a single complaint from any of our clients who concluded that acquiring 501(c)(3) status was not a worthwhile endeavor. Our staff is 100% confident that the benefits of becoming a 501(c)(3) organization by far outweigh any perceived or actual disadvantages. Although there is certainly no guarantee that your organization will secure more revenue through this status, your chances are much greater than they would if you did not acquire tax exempt status. Once you submit your online order and it is processed, you will be emailed a series of questionnaires and instructions. What do your Questionnaires consist of? They are Word and Adobe Acrobat documents and consist of questions designed to elicit the required information from you. The financial data document is in Excel. You type your answers right on the Questionnaires and e-mail them back to us. In this way, we get all the information from you to prepare all your documents. Of course, we give you guidance in answering the questions right on the questionnaires themselves (tips, pointers, helps, samples, suggestions, etc. ), and we are also available by phone should you need additional guidance. With the 501(c)(3) Questionnaire, we also give you sample answers taken from cases that went through the IRS quickly and easily. Once submitted to the IRS, it takes an average of 60 to 120 days to process an application, although it can take longer depending on the current volume of applications being processed. Approximately 25-33% of the applications they receive do not require further questioning and are processed in less than 90 days. However, depending on other extenuating factors, IRS processing can take much longer. For a detailed flowchart of IRS exempt application processing, please click here. Once your organization is approved, you will receive an IRS Determination Letter. This is your one and only indication that you are officially a 501(c)(3). We suggest you make numerous copies of this letter and safeguard the original. Contrary to popular belief, there is no such thing as a "tax exempt number" Your tax id will remain as your original EIN. Your EIN on its own does not indicate whether or not you are tax exempt. Only your Determination Letter verifies your tax exempt status. Can we ask for donations before we get our tax exempt status? This is dependent upon when your organization was formed. If your organization submits its application to the IRS within 27 months of creation and is ultimately approved, the "effective date" of your organization’s tax exempt status will be retroactive to the date that your Articles of Association, or Articles of Incorporation were approved by your board of directors. This means that contributions that your organization received after formation, but before the IRS issued your exemption letter will be deductible. For organizations that were formed longer than 27 months ago, your tax exempt effective date will instead be the postage date when the application is mailed to the IRS. Because there is, of course, a chance that your application for tax exempt status will be turned down, it is prudent to let your potential donors know that you do not actually have IRS approval yet and indicate that your 501(c)(3) application is pending. What responsibilities accompany 501(c)(3) status? While there are certainly a multitude of benefits to acquiring 501(c)(3) status, federal tax law also imposes certain responsibilities as well. 1. Record Keeping-Organizations are required to keep books and records detailing all activities, both financial and non-financial. Financial information, particularly information on sources of support (donations, sponsorships, grants, membership fees, etc.) is crucial. 3. Disclosure Requirements-501(c)(3) organizations must make their application and their 3 most recent annual information returns available to the public when so requested and without charge. 4. Charitable Contributions-501(c)(3) organizations must provide a written acknowledgement for any single donation of $250 or greater before the donor can claim a charitable contribution on his/her federal income tax return. Do we need to hire a CPA to manage our books? Although it is complex to secure tax exempt status, once you have the status, it is surprisingly easy to do the bookkeeping in most cases. It is our opinion that you can prepare your own 990-N and 990-EZ information returns on your own. Once your gross revenue exceeds $200,000 per year, it is recommend that you have an accountant that specializes in tax exempt organizations prepare your 990 informational return. Will we also be exempt from paying our state income tax after receiving 501(c)(3) status? In 18 states, organizations are automatically exempt from state income taxes once approved for federal tax exemption. In 26 states, you will be exempt from income taxes but you must file for it once approved for federal tax exemption. In the remaining 6 states there is no corporate income tax and no action is required. Please click here to review our state by state tax exempt application information.